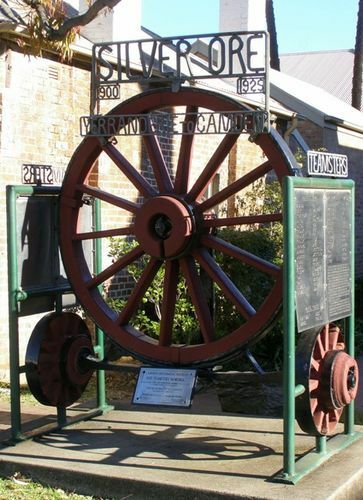 Silver Ore Memorial Wheel ,a gift from the Henderson Family to the municipality of Camden commemorates the teamsters who carried silver ore from Yerranderie to the Camden railhead. The ore was originally forwarded to Germany for smelting, but from World War One it went to Port Pirie in South Australia, and later to Newcastle. The field was operative from 1900 to 1925. There are at present 15 different teams (horse and bullock) plying between Yarranderrie Silver Fields and Camden, and Mr. Fred Dowle of Cawdor, is likely to increase the number by starting at an early date. South Coast Times and Wollongong Argus (NSW), 5 March 1904.